Having missed the Grouse Gulch TH by a few hundred yards the previous day, I had ended up a different watershed and climbed two unplanned 13ers instead. Today I wanted to ride back up to the correct TH to go after Handies Peak, the highest 14er in the area around Silverton, CO. With an earlier start I would have more time for some additional bonus peaks which I would have missed out on had I done it yesterday. I was up, breakfasted and on my way up County Road 2 on the bike shortly after 6a. With better research, I had no trouble finding the trailhead today. There is no sign at the road indicating "Grouse Gulch", but the BLM signs made it clear this route was open to foot traffic only. The trail starts at 10,800ft and climbs to a saddle at the head of Grouse Gulch at 13,000ft in about 2mi. Most of the route is above treeline and the views are nice the whole way. One starts by looking down on the Animas River Valley, then climbing high into the alpine vegetation of Grouse Gulch, very green at this time of year. Despite the nice scenery, it is not a very well-used trail as it is not the shortest route to Handies. The most popular route to Handies starts from the American Basin TH. When I reached the saddle between Grouse Gulch and American Basin, I could look down and see the cars parked at this TH. It lies some 800ft higher than the Grouse Gulch TH and cuts off several miles each way. In addition, my route would now have to drop 600ft to meet the Handies Peak Trail lower in American Basin. Such is the extra work needed for not having a high-clearance vehicle. Luckily it's an incredibly scenic area and I didn't mind the effort at all. Almost as soon as I reached the trail junction I began to cross paths with the usual crowds the 14ers attract. The trail winds its way up the picturesque basin carpeted in green, going past Sloan Lake which is nestled in a small cirque at the base of American Peak's North Face. 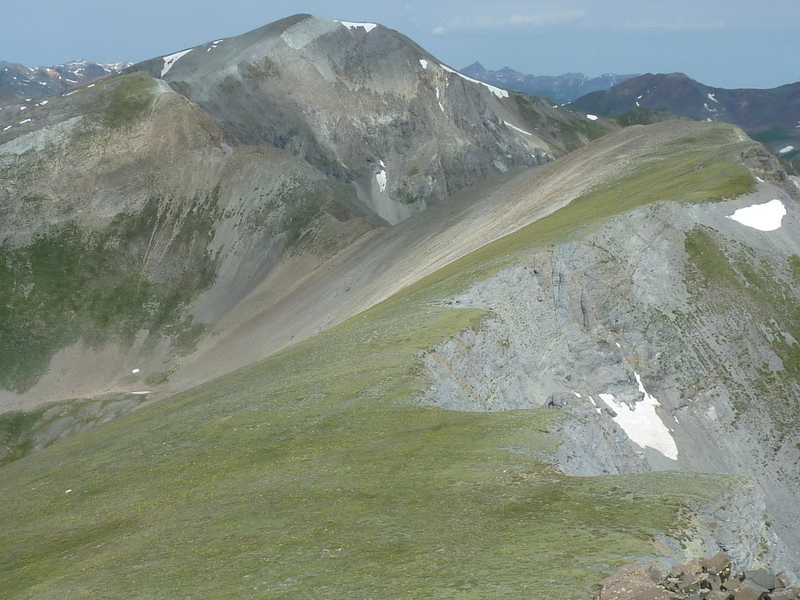 By 8:45a I had reached the saddle between American Basin and Boulder Gulch, on Handies' South Ridge. The trail continues up from here, taking another 15-20min to reach the summit. There were two others at the summit, one heading down as I was arriving. The trail continues over into Grizzly Gulch to the northeast, a nice alternative if done in conjunction with nearby Whitecross Mtn. I would have liked to go tag that one as well, but I had my sights set on the higher, unnamed Peak 13,795ft to the east along a different path. Doing Whitecross would have added considerably to the elevation gain and miles for the day. Without a register to occupy my attention, I spent probably 30 seconds at the summit, long enough to snap a few photos and greet the other visitors. Turning eastward, I dropped off Handies' SE Ridge and began the 1.5mi traverse to Peak 13,795ft. This was not one of the pleasant, vegetated ridgeline hikes I had come to expect in Colorado, but more like ones found in the Sierra Nevada, replete with rock, talus, rock, scree, and more rock. Much of it was straightforward enough, but steep talus sections were enough to lose any hope of a recommendation. It took an hour to make my way from Handies to the other summit and about the same time for the return. The summit held a register with four pages of entries starting in 2013, about typical for a Colorado summit. It ranks as CO's 109th highest summit, so it sees a good deal of traffic, though of course not as much as Handies. In order to avoid returning to Handies' summit, I made a high traverse across that peak's steep SE slope, a tedious effort that may have saved only a few minutes' time in the end. Back on the South Ridge, I headed down the Handies Peak Trail into American Basin and then back up to the saddle with Grouse Gulch. Here I turned northwest and followed the ridgeline towards Cinnamon Mtn, first going over Peak 13,535ft with a register just a month old. With more than 500ft of prominence, it's the highest point between the saddle I'd just left and Cinnamon Pass another 1.5mi to the north. The summit has a grand view of American Basin to the east with Whitecross and Handies rising behind it. In contrast to the earlier ridgeline, this one was far more pleasant and easy-going. In following the pattern of the last week, the weather continued to be threatening in the afternoon, but today there would be no rain or hail to spoil things. I spent about 40min traversing the ridge to Cinnamon Mtn which overlooks the Cinnamon Creek drainage and Pass to the north. County Road 5, part of the Alpine Loop, goes over the pass and down to Animas Forks at the junction with the road I had started on. I could see several vehicles plying the road and several more stopped at the pass to take in the views. My plan was to drop to Cinnamon Pass and hike (or hitch-hike) the roads back to where I'd left the bike. Rather than divert to the pass which was a little out of the way, I instead dropped off Cinnamon's North Ridge, a shorter way to reach the road. Some cliffs lower down required me to turn right off the ridge before finding a way to easier ground below. It was 1:40p by the time I reached the road. Realizing I only had a few miles to go and that the weather was holding, I didn't bother to hitch-hike as I made my way down to Animas Forks. The number of Jeeps and OHVs I encountered increased significantly at this popular junction. There are some summer homes here, public restrooms, and various stops that attract the enthusiasts driving the Alpine Loop. By 2:30p I had returned to the bike, happily finding it just as I'd left it. Another 15min would be taken in riding it back to the van two miles down the road along the Animas River.